Here's a 9/11 Conspiracy for you. 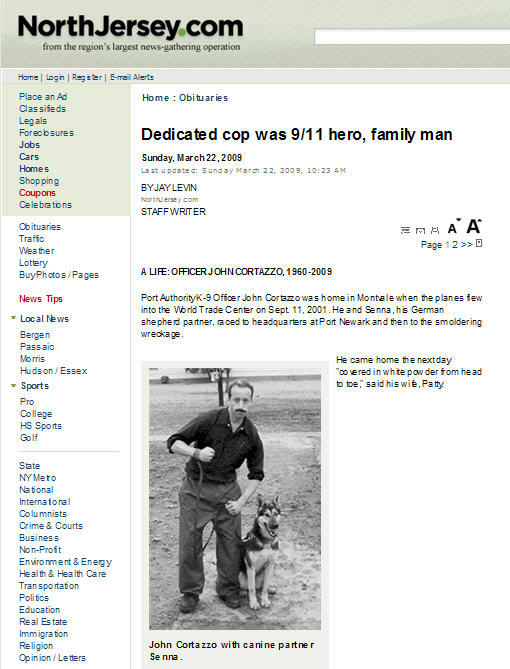 Let's forget the heroes that dove into the pile to rescue and recover at WTC. Let's deny access to care, deny health benefits and limit or cancel funding to support their health and well being. They get sick, sicker and dead but let's ignore the issue and the broken families left behind to cope. Where are all of the politicians that used WTC as a photo-op backdrop for their campaigns, their platforms, their legacies? 9/11 is STILL KILLING 17 years on. Please Click The Picture and Sign The Petition! Click The Pic To Visit And Help! Washington, D.C., Sept. 28 � Today, New York Reps. Carolyn Maloney (D-NY), Jerrold Nadler (D-NY), Vito Fossella (R-NY), and Peter King (R-NY) announced their regret that H.R. 7174, the revised bipartisan 9/11 Health and Compensation Act, will not be able to move to passage during the last days of the current House session. �We thank Speaker Pelosi and her staff as well as the House Energy and Commerce and House Judiciary Committees and their staffs for their tremendous effort to try to move this legislation through this session which would help those who, fully seven years after the 9/11 attacks, still don�t have the health care and support they need,� they said. 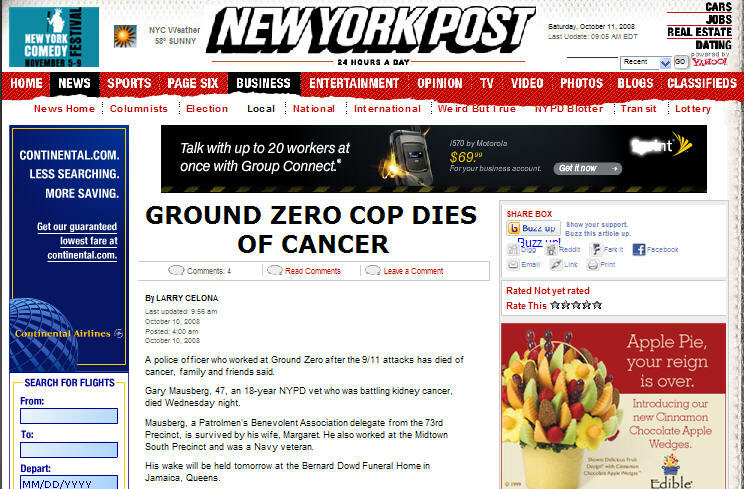 �We will work together in the future to try to address this failure and meet the sizable need to care for those who lived and worked in the immediate area around ground zero�not to mention those who helped in the immediate aftermath,� the Members concluded. The lawmakers had made changes to the bill, H.R. 7174, to reduce its overall cost and pave the way for a House vote. The $10.9 billion bill had been fully paid for through revenue offsets. For more information, including actual bill language, click here. 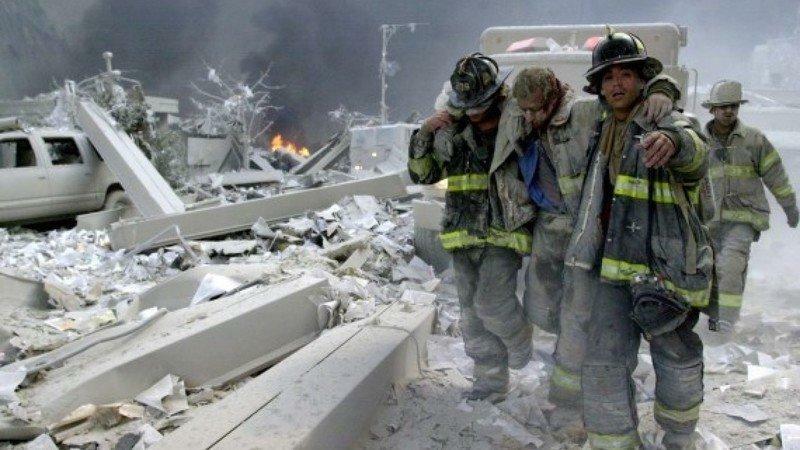 ● Thousands of first responders and others exposed to the toxins of Ground Zero are now sick and need our help. These include New York firefighters, EMTs and police, construction workers, clean-up workers, residents, area workers, and school children, among others. ● Although most of these people live in the New York/New Jersey area, at least 10,000 people came from around the country to help in the aftermath of the attacks. They hail from all 50 states and nearly every congressional district. Many are sick and others are very concerned about their health. ● Their illnesses include respiratory and gastrointestinal system conditions such as asthma, interstitial lung disease, chronic cough and gastroesophageal reflux disease (GERD), and mental health conditions such as post-traumatic stress disorder (PTSD). ● More than 400,000 people are believed to have been exposed to toxins from the World Trade Center site. ● Nearly 16,000 responders and at least 2,700 community members are currently sick and receiving treatment. More than 40,000 responders are currently in medical monitoring. 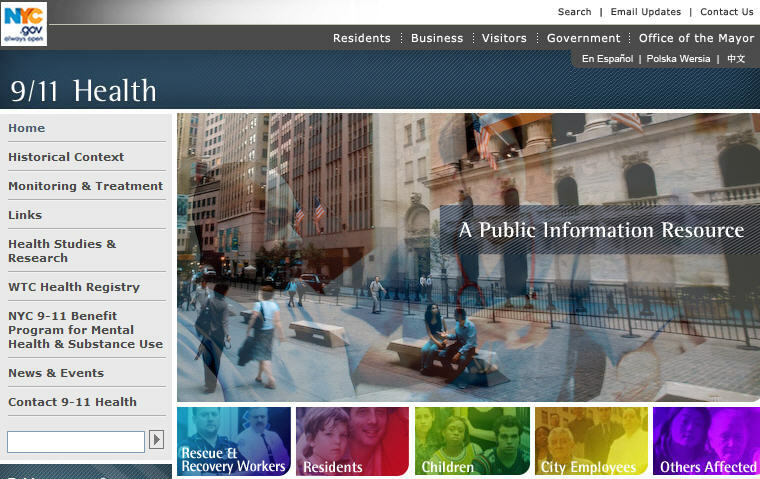 71,000 individuals are enrolled in the WTC Health Registry. ● Those who suffered economic losses as a result of their WTC-related illnesses need and deserve compensation, but have no alternative to the current litigation system. 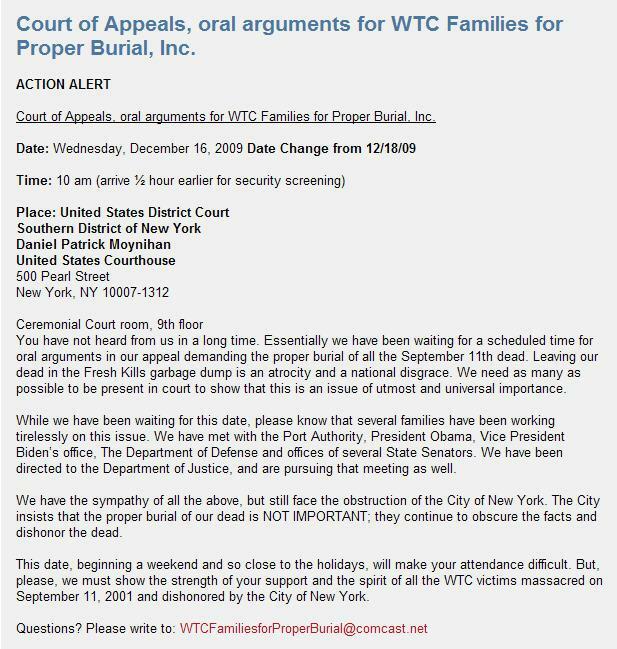 ● The WTC Contractors and the City of New York are being sued by over 10,000 people who are sick because of Ground Zero toxins. They face great financial loss because they were asked to help at Ground Zero in the country�s time of need. ● Providing medical monitoring and treatment to WTC responders and community members (area workers, residents, students and others) who were exposed to toxins released at Ground Zero. ● Building on the existing monitoring and treatment program by delivering expert medical treatment for these unique exposures at Centers of Excellence. 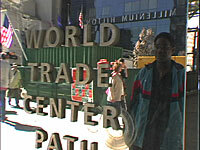 ● Providing for research into WTC-related health conditions. ● Reopening the 9/11 Victim Compensation Fund to provide compensation for economic losses and harm as an alternative to the current litigation system. ● Providing liability protections for the WTC contractors and the City of New York. Washington, D.C. - Today, Reps. Carolyn Maloney (D-NY), Jerrold Nadler (D-NY), and Vito Fossella (R-NY) released a letter they wrote to Health and Human Services (HHS) Secretary Michael Leavitt to express their concerns about ongoing delays in HHS's program to provide health care to 9/11 responders and others sickened by the attacks who live outside the metropolitan New York area. In June, HHS awarded a contract to Logistics Health Incorporated (LHI), a Wisconsin firm run by former HHS Secretary Tommy Thompson, to provide 9/11 medical monitoring and treatment services nationwide. In their letter, a full copy of which follows, the lawmakers note that LHI's monitoring exams will begin at the earliest in September, rather than July as originally promised; that many, if not most, responders eligible for the program have yet to receive any information from LHI; and that sick responders are experiencing significant delays in getting appointments arranged, prescriptions filled, and phone calls returned. "What's LHI been doing for the last three months? Tommy Thompson didn't make 9/11 health a priority when he was HHS secretary and his new firm appears to be following suit," said Rep. Maloney. "LHI was awarded millions in federal funding to provide monitoring and treatment, not silence and confusion." "These men and women came from every state in the nation to aid in the massive rescue and recovery effort at Ground Zero, putting their health, and even their lives, in danger," said Rep. Nadler. "Time and time again, these first responders have been promised health care for their 9/11-related illnesses, but nearly seven years later, they can't get LHI to return their phone calls? The heroes of 9/11 have already waited too long for the comprehensive health care they deserve, and LHI's continued foot-dragging is outrageous." James Melius, MD, Administrator, NYS Laborers' Health and Safety Health Fund & Chair, WTC Medical Monitoring and Treatment Program Steering Committee; Micki Siegel de Hernandez , Health and Safety Director, Communications Workers of America, District 1; and John Feal, Founder of the Fealgood Foundation and a 9/11 responder. In March, the CDC announced a solicitation for sources to provide federally-funded medical monitoring and treatment to thousands of 9/11 responders who live outside metropolitan <?xml:namespace prefix = st1 ns = "urn:schemas-microsoft-com:office:smarttags" />New York City. (Click here for a copy of the CDC�s announcement.) In June, the CDC awarded a $14 million contract to LHI to provide these services. The national 9/11 health program has been fraught with delays. In December 2007, the Administration suddenly announced that it was abandoning its initial plan to create the program. At the time, the CDC expressed concerns over the availability of continued funding, even though Congress was in the process of approving another $108 million for 9/11 health care. According to the federally-funded World Trade Center Health Registry, people from all 50 states and 431 of 435 Congressional districts nationwide were in lower Manhattan on or after 9/11 and now have serious concerns about their health. In all, more than 10,000 of the 71,000 people enrolled in the Registry live outside the tri-state area of New York, New Jersey and Connecticut. 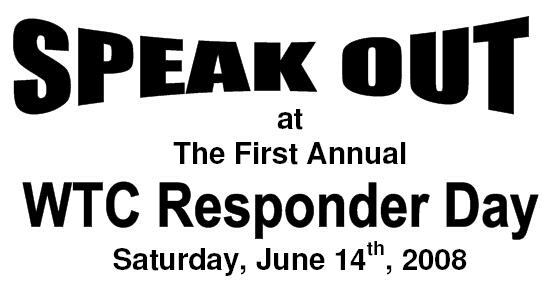 We respectfully write to express our continued concerns about the implementation of the program for World Trade Center (WTC) responders who live outside of the New York City metropolitan area (the so-called �national responders�). Since the recent dismissal of outstanding, former NIOSH director, Dr. John Howard, you have become more familiar with the WTC medical program and the fact that there have been repeated delays in making monitoring and treatment services available for national responders. These problems have been compounded by the decision of your agency, last December, to cancel the procurement process for an outside contractor to manage this program. A more limited procurement process was initiated this spring and a contract was awarded to a Logistics Health Incorporated (LHI), a Wisconsin firm. At that time, we were assured that monitoring and treatment services for the national responders would be transitioned to the new contractor without any significant delay. Unfortunately, these assurances appear to be another empty promise. Our offices have learned of repeated instances of problems with the implementation of the contract in addition to an apparent reluctance to share information about the transition to the new program with people representing the national responders. � The monitoring exams will not start until September, not July as originally promised. � Many, if not most, of the national responders have yet to receive any information from the new contractor about either the monitoring or treatment services. � Sick responders newly referred to the treatment program are experiencing delays in getting appointments arranged. � People currently receiving treatment are having trouble getting their prescriptions filled and other medical services from the new program. They are even having difficulty getting the new contractor to return their calls in a timely fashion. � Social services to provide assistance with worker�s compensation and other critical issues are not yet in place. � Representatives of the responders who have asked for simple information such as copies of the sample letters that have been sent to explain the transition and the arrangements for the new services have not been provided that information. These delays and other problems are not acceptable. We are therefore requesting a meeting with you as soon as possible to discuss what you are doing to address these problems and to provide these heroes the services that they deserve. � Any letters, emails, or correspondence that has been sent out to responders from LHI that explains the transition and the arrangements for the new services. � Any communications between LHI and potential clinic service providers that explain program and costs. � Any budget planning documents prepared by LHI that provide information on projected spend rates and projected patient participation rates. 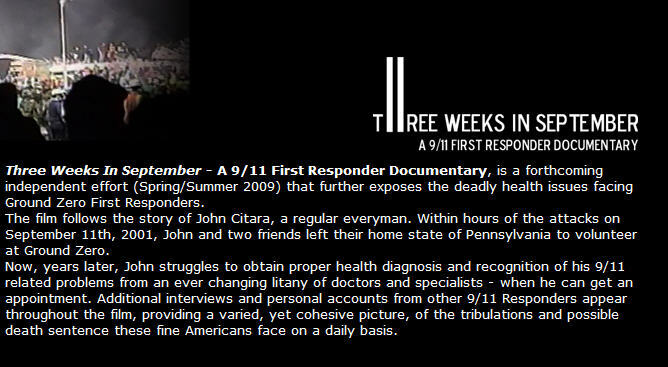 Click the pic to view the Sierra Club Documentary "9/11 Forgotten Heroes"
John Feal, Marvin Bethea, Jonathan Sferazo and Mike McCormack want justice. 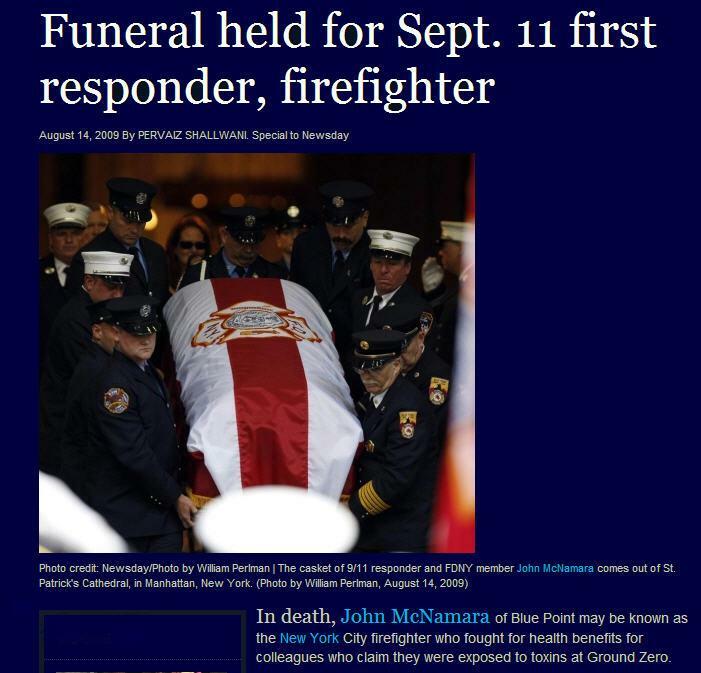 Before September 11, 2001, Feal was a jock and robust construction supervisor, Bethea a life-saving paramedic, McCormack was a decorated emergency medic, and Sferazo was proud steelworker. At ground zero all four of these New Yorkers gave everything they had to the search and rescue effort. What they were told about the safety conditions at the site and what was the truth are now emerging as two very different tales. The federal government ignored its long-body of knowledge about incineration and demolition. It also ignored the results of independent studies that contradicted its findings. Were they afraid of mass hysteria? 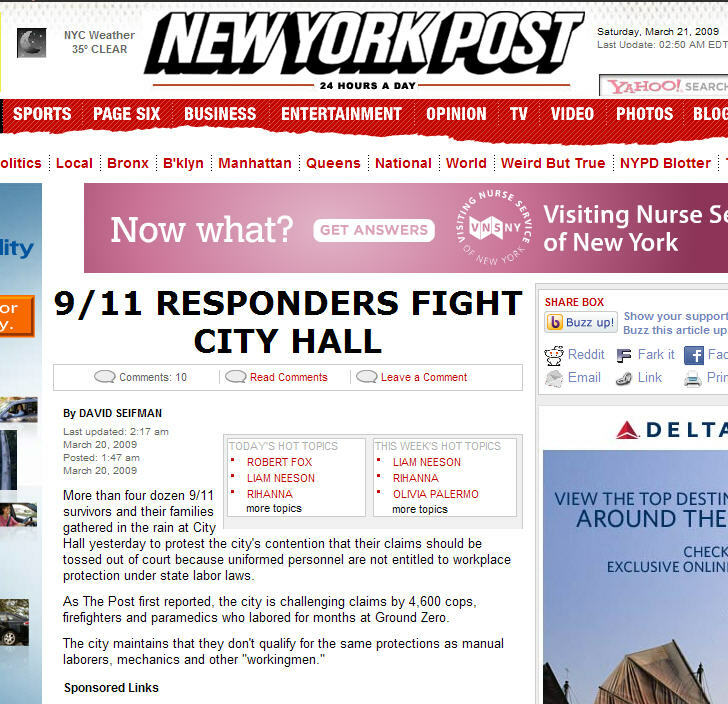 Did they think the rescue effort would not continue if they were honest with New Yorkers? "I have no idea" says Feal. "All I know is that they didn't tell us what was really in the air down there, and now me and my friends are paying the price for their lies." Soon after 9/11 Feal and his friends started experiencing serious respiratory problems, a condition they now call "The World Trade Center Cough." Feal spent two months in the hospital last year. Sferazo can't climb a flight of stairs without doubling over in pain. 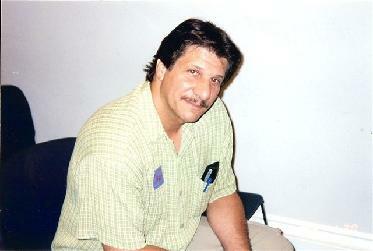 Bethea suffers from permanent sinusitis as well as post traumatic stress and asthma. Hundreds of rescue workers are sick and that number is expected to rise sharply over the next several years. Because of an arbitrary technicality in the law Feal, Sferazo, Bethea, McCormack and many more search and rescue workers no longer qualify for help from the 9/11 relief fund. Angry and now disabled John Feal says, "They called us "'Heroes'"!? But where are our heroes? We are the ones that need the help now. Where is it?" We travel with Feal, Sferazo, Bethea and McCormack as they have an important step towards holding their government accountable. They are banding together to lobby congress - traveling via caravan down to Washington DC where Congress is considering an amendment to a bill, the Walsh Amendment, that will set aside $125 million of unspent 911 money to help New York State residence with the current and future 911-related health expenses. If this amendment doesn't pass, Congress will reclaim this unspent money and John Feal and his friends will be left out in the cold again. In December 2005, $125 million was restored through a defense Appropriation bill. While it will help cover medical screening and treatment, the money will only meet a fraction of the first responders' needs. Meanwhile, Senator Hillary Rodham Clinton and Congressman Jerrold Nadler have called for an investigation of the EPA's failure to carry out proper testing and cleanup of 9/11 pollution. Download Original version of "Never Forget.MP3"